This is Tim's foster dog, Pixie, with a toy pheasant sent by Aunt Marika and Cousin Dash. 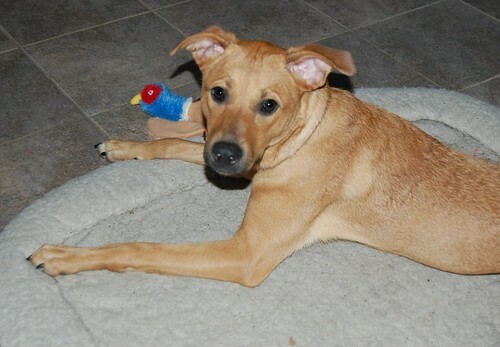 Pixie has a happy, playful personality and is lots of fun. She's helping me miss Maverick a little less (he's currently vacationing in New Mexico with his foster mom, because he's lucky enough to have two foster homes until he finds his forever family). From July 16th-19th, Scout's Honor Rescue will have a booth at the Reliant Park World Series of Dog Shows. They'll be there with some of their adoptable dogs as well as lots of information on fostering and volunteering. Don't miss out on some awesome raffle baskets and other goodies. Meet their dogs and be amazed by all there is to see at the dog show, from agility competitions to the market.